The island of Key West is a tiny five square miles, but each of its primary neighborhoods displays its own individual charm. From the classic Conch cottages and soaring Victorians of Old Town to the mid-century modern homes and Mediterranean mansions in the Casa Marina District, Historic Key West Vacation Rentals offers exceptional choices for visiting guests for their stay. Key West’s oldest and most historic neighborhoods include Old Town, The Meadows, Bahama Village and the Casa Marina District. Truman Annex, once the home of military personnel, is just blocks from Old Town. Old Town itself — at least for locals — includes Old Town South-of-Truman and Old Town North-of-Truman. There’s also Midtown — East and West — and New Town, where you’ll find larger lots and what many would describe as luxurious “traditional Florida” construction. Just across the harbor from Mallory Square is Sunset Key, a much newer, exclusive enclave of homes accessible only by a quick shuttle boat ride from the dock. With their eclectic personalities, each neighborhood offers easy access to the best of Key West — from dining and theater to water sports and amazing sunsets. The famous historic Old Town Key West waterfront on the gulf side of the island and the original lower Duval Street area, encompasses this district. Here the founding fathers and mothers of the late 1800's built the first shipping docks and warehouses, restaurants and grand homes, that stand today as one of the largest and most impressive collection of turn-of-the-century architecture. From larger Greek Revival Victorians to charming shot gun cottages, many of these alluring structures have been restored and renovated to stand in their gleaming glory. Today this district includes famous waterfront restaurants and bars, retail stores, museums, fishing and sailing charters, a large variety of historic homes, and Mallory Square. This exclusive residential area of Old Town Key West is really an extension of the Old Town Historic Seaport District where the harbor 'rounds the bend.' It was originally developed as a suburban neighborhood in the early 1900's and has a distinctively gracious and private feel with wider tree lined streets and larger yards. 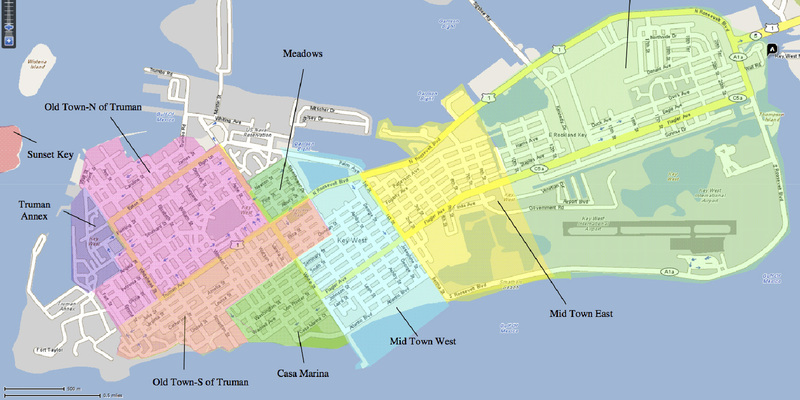 There is less commercial development than the seaport side of White Street and the center of Old Town. Yet, the Meadows is flanked by White Street that offers many locally favorite restaurants, art galleries, bakeries, and shops. Many of the Meadow's residents live in Key West year around. From here you can walk to the Historic Seaport in 5 to 10 minutes and walk to Duval Street in 20 minutes. Sandwiched between the White Street Gallery district and New Town Key West, the blurred boundaries of this section are generally described as First to White streets, and North Roosevelt Blvd., to Flagler Ave. Mid-Town Key West is decisively residential, created from landfill in the 1940's and 1950's to allow for early suburban development. Architecture mostly reflects the style of modest mid-century homes with nice big yards. Many local families live in this home town neighborhood. But with sky rocketing property values in Key West since the late1990's, these homes too are creatively renovated into unique island dream homes with lush tropical landscaping and swimming pools. This little "off-the-beaten-path" neighborhood is so close to the beach, White Street, and New Town Key West, many consider it the perfect location. It takes about 20 minutes to bike to Upper Duval. While most people don't walk from here to town, it goes quicker than you would imagine and there is much to see along the way. The signature building for this section of Key West is the historic 1920's Henry Flagler Hotel. Flagler developed the overseas railway that extended all the way from the mainland of Florida to Key West with his luxurious ocean front building as a prominent destination. Now named the Casa Marina, this small exclusive residential district has grown into one of the most sought after neighborhoods in Old Town Key West. In the mid 1900's this area was considered the "country side" of the island, and the modern day result leaves a legacy of outstanding turn-of-the-century, mid-century and modern architecture with beautiful gardens and more yard space than is typically found in the other residential districts in Old Town Key West. This a quiet residential area, close to the Atlantic Ocean, beach front restaurants, the Southernmost Point of the United States, the South end of Duval Street, and the White Street gallery and shopping area. From this area you are a 3 to 5 minute walk to the beach and a 20 minute walk to Duval Street.